Turns out some of your favorite films — from Fantasia to Aladdin, Dumbo to The Little Mermaid – are downright offensive. You watched Disney cartoons as a child, but you probably never picked up on the racist subtext within. Why would you? You were a child! But now, in hindsight, we can see that unfortunately, some of our Disney favorites are actually glaringly racist. For instance, did you know the original release of Fantasia had dark-skinned centaurs working as servants for light-skinned centaurs? That The Little Mermaid’s Sebastian is considered offensive to Jamaican culture? Or that the happy ending of Pocahontas white washes the brutal killings of Native Americans? There’s more where that came from. These are the 10 most racist Disney movies you probably didn’t even notice were racist. The original release included the now controversial character “Sunflower,” a small dark-skinned centaur with braided hair who played servant to the larger, light-skinned, blonde and dainty centaurs. The racial implication here is glaring: casting the dark-skinned character as subservient to her light-skinned counterpart. You probably didn’t notice this because Disney’s removed the scene from the movie, so any modern version of Fantasia will come to you slavery-free. We know what you’re thinking. “Dumbo? NEVER!” Unfortunately, the story about the little elephant that could has some deep racist undertones. First, the cartoon crows speak in heavy southern African-American jive. But before you cry “coincidence,” consider this: the leader of the crows is named Jim Crow, which was also the name of the laws that brought segregation to the South in the late 1800s and continued until 1965. The crows are also portrayed as dim-witted, annoying, and lazy. Songs of the South is one of those movies we all silently agreed to wipe from pop culture, and because of that, the movie has never been re-released. It didn’t take people long to figure out this was blatantly racist — after all, it’s a movie about a former black slave singing songs and telling stories while still living on the plantation he was enslaved in. Not OK, Disney. If you’ve never seen the movie (which most people born in the latter half of last century probably haven’t), you might be familiar with a little song called “Zip-a-Dee-Doo-Dah” (and yes, you might want to consider not humming that to yourself anymore). The story of a boy who never grows up runs into some problems — big problems — with its portrayal of Native Americans. There’s a song called “What Makes The Red Man Red,” which is problematic enough. Aside from the offensive song, none of the Native Americans actually speak to Peter and the gang. Instead, the chief of the tribe speaks in broken jargon, stereotypical to the way Native Americans are mocked. White children Peter, Wendy, and Co. also partake in cultural appropriation by donning feathered head dresses, brandishing tomahawks, and running around making “whooping” noises while fanning their mouths with their hands. Lady and the Tramp had its share of racist moments in its stereotypical, caricature-ish portrayals of different races. Its Siamese cats, Si and Am, are drawn with slanted eyes and they speak with a stereotypical Asian accent, and also also portrayed as villainous and sneaky. There’s also a chihuahua who speaks with an exaggerated Mexican tone. When Mowgli, our hero, meets some apes in the wilderness, it might seem innocuous enough. However, what strikes you is that while everyone in the film speaks in British English, the monkeys speak in jive. Louie, the king of the apes, is portrayed as lazy, fat, and a little dumb… sound familiar? The jive talking crows in Dumbo were portrayed in much the same way. The Little Mermaid has many problems. Change who you are to impress a man? Sheesh! There’s also some not-so-subtle racism at play. Some take issue with the portrayal of Sebastian the crab, who has a Jamaican accent and advocated staying under the sea because you don’t have to get a job there. The theme of portraying dark-skinned cultured as lazy recurs throughout Disney movies. The Little Mermaid also has problems with its drawings of the fish “Duke of Soul” and “blackfish” with fuller lips. The original version of the opening song “Arabian Nights” included the lyrics “Where they cut off your ear / If they don’t like your face / It’s barbaric, but hey, it’s home.” This misrepresentation of Middle Eastern culture wasn’t happily met, and the lyrics were changed to “Where it’s flat and immense and the heat is intense” for the DVD release. Critics of Aladdin also suggest that the titular character is designed to be whiter than the antagonist, Jafar. Aladdin, the good guy, is fair-skinned and speaks with an American accent. Jafar, on the other hand, is darker-skinned and has stereotypical facial hair and ethnic features. 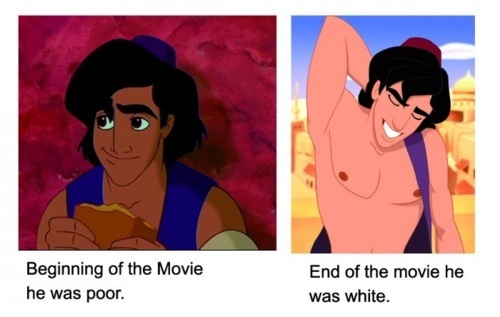 There’s also the suggestion that Aladdin’s skin becomes whiter after he defeats Jafar. Pocahontas enforces the idea that there are two types of Native American: the noble savage and the violent savage, which is a damaging and offensive categorization. It also whitewashes history with its happy ending, failing to acknowledge the brutal slaying and oppression of Native Americans by white settlers, painting a rather convenient picture for white history. The film lauded for bringing diversity to the world of the Disney princess, with the first black princess, Tiana, is still racist. Critics of The Princess and the Frog have pointed to Tiana’s love interest, Prince Naveen, as the movie’s biggest problem. While Tiana is “obviously” black — in skin tone, voice, and facial features — Naveen is ethnically ambiguous. Naveen’s home country, Maldonia, is left as a question mark, so the audience never really knows where he comes from, and likewise his accent is confusing and difficult to place. It’s been suggested that these are all devices used by Disney so that they didn’t have to have an identifiably black male playing a king i.e. in a position of power.